Are Trimline Treadmills Right for You? Update: This treadmill brand has been discontinued. But we will still keep this page live here since most of these Trimlines are still being sold on the internet through auction sites or as refurbished treadmills. As an alternative, I would recommend you visit our Smooth treadmill page which offers similar machines from Trimline. If you are attracted to long warranties, then this is the brand for you. Trimline has one of the longest warranties in the mid-priced treadmill category. Trimline started operations in 1994. Brothers Bill, Joe and Bob Hebb opened their Trimline manufacturing facility with a simple business philosophy: offer top-quality, user-friendly treadmills at affordable prices. 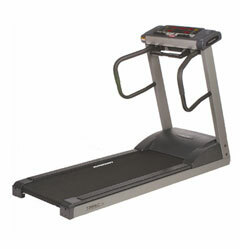 Trimeline treadmills are priced around $1,500 to $2,500. They fall in the mid-price treadmill category. This price range usually offers 18 inch wide running belts with 2.0hp motors. With Trimline, this is exactly what you'll get. These treadmills have good cushioning, stability, and are fairly quiet. But the main competitive edge of this company is its warranty. They are offering a 30 year warranty on frames and a 2 year warranty on parts and electronics. You'll also get a 30 year motor and a 2 year labor warranty on their higher priced treadmills while a 10 year motor and 1 year labor warranty comes with their lower priced treadmills. According to some Trimline owners, one thing they didn’t like about their treadmill is that its user’s manual is a little light on information. Also, they say that some models have limited display information. You can buy your Trimline treadmills from a dealer near you or an online retailer. Either way, make sure you get the warranty Trimline is offering by asking about it. Some retailers are offering their own warranty. I recommend Trimline treadmills for their durability and warranty. It’s hard to find a machine belonging in the mid-price category offering warranties as long as theirs. This just proves how confident Trimline is with their treadmills and how committed they are into satisfying their customers. Below are some of the more popular Trimlines that we have reviewed. Others: this is considered as Trimline’s most basic and most affordable model. Others: buying this treadmill would make more sense than the T305 above. Others: A basic mid-priced treadmill. Others: this is the most expensive Taiwan built Trimline treadmill. Others: one of the best treadmills below $1,500. Others: this is one of the best folding treadmills in the market today. Others: this is Trimline's high end folding treadmill. Others: this is probably the best Trimline treadmill in the market today. Others: this is Trimline's high end HR unit. Others: was built and designed for residential or light commercial use.